18 carat rose gold and stainless-steel case with a 18 carat rose gold and stainless-steel bracelet. Fixed diamond set bezel. Silver-toned dial with rose gold-tone hands and Roman numeral/index hour markers. Minute markers across the outer rim. Dial Kind: Analog. Eco-drive movement. Scratch resistant sapphire crystal. Skeleton clear exhibition see thru case back. Case diameter: 30 mm. Round case form. Folding clasp. Water-proof at 30 meters / 100 feet. Functions: hour, minute, second. Additional Info: five floating diamonds on dial. Luxury watch taste. Watch label: Swiss Made. 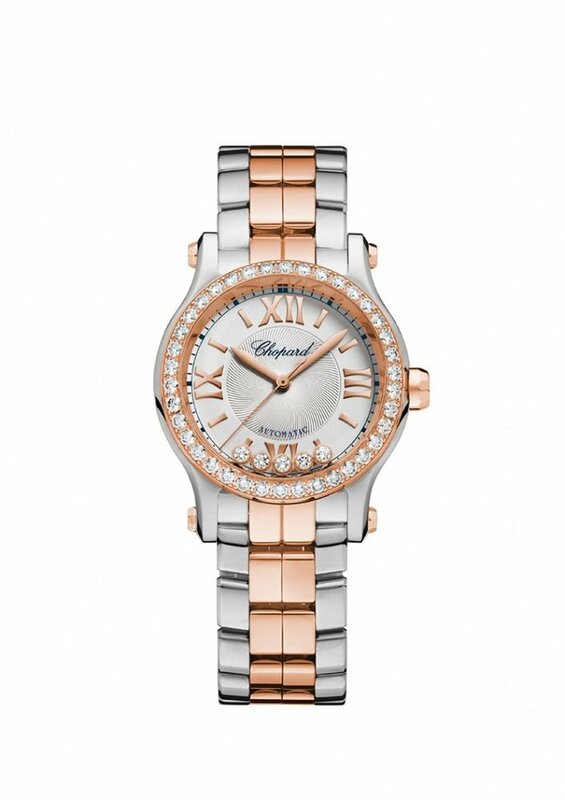 Chopard Glad Sport 18 Carat Rose Gold and Stainless Steel Women Watch 278573-6004.